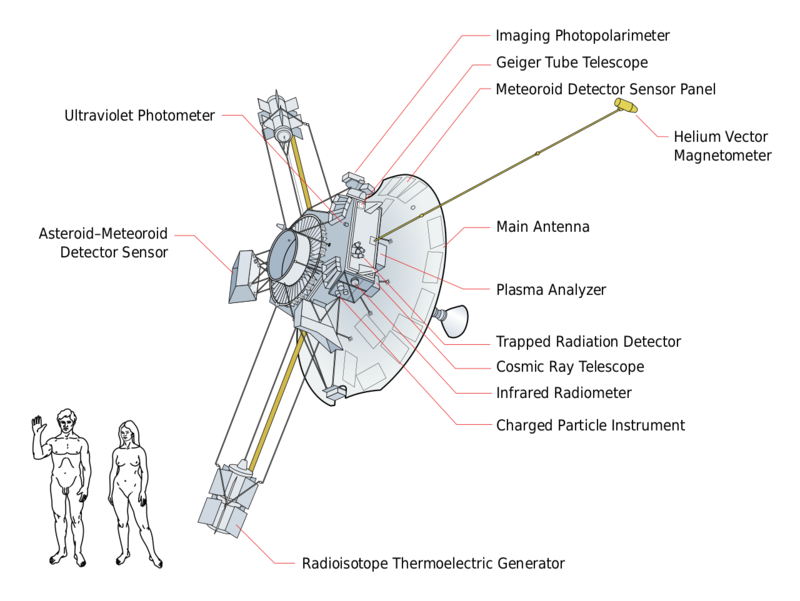 Pioneer 10 was launched on 2 March 1972 and would become the first spacecraft to pass through the asteroid belt found between Mars and Jupiter, and the first to get up close to Jupiter. It was also the first to leave the Solar System and head into deep space. Because it was going further than anything man had made before, attached to it was a plaque created by the science writer and astrophysicist Car! Sagan, along with his wife Linda Salzman Sagan and the astrophysicist Frank Drake. Its purpose was to convey who, when and from where it had come to whoever might discover Pioneer 10 during its journey. 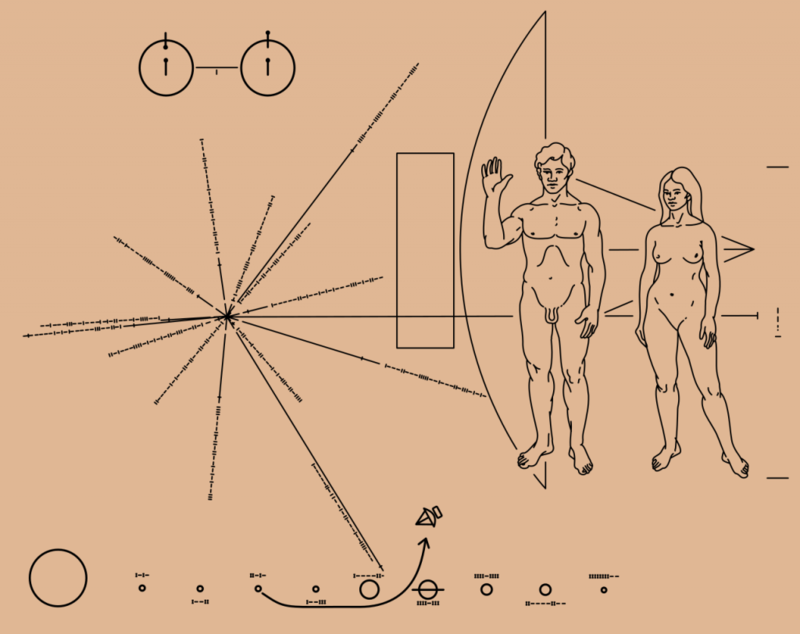 The Pioneer  spacecraft, destined to be the first manmade object to escape from the Solar System into interstellar space, carries this pictorial plaque. It is designed to show scientifically educated inhabitants of some other star system, who might intercept it millions of years from now, when Pioneer was launched, from where, and by what kind of beings. (With the hope that they would not invade Earth.) The design is etched into a 6 inch by 9 inch gold-anodised aluminum plate, attached to the spacecraft’s antenna support struts in a position to help shield it from erosion by interstellar dust. The radiating lines at left represent the positions of fourteen pulsars, a cosmic source of radio energy, arranged to indicate our sun as the home star of our civilisation. The ‘1-‘ symbols at the ends of the lines are binary numbers that represent the frequencies of these pulsars at the time of launch of Pioneer  relative to that of the hydrogen atom shown at the upper left with a ‘1’ unity symbol. The hydrogen atom is thus used as a ‘universal clock’, and the regular decrease in the frequencies of the pulsars will enable another civilisation to determine the time that has elapsed since Pioneer  was launched. The hydrogen is also used as a ‘universal yardstick’ for sizing the human figures and outline of the spacecraft shown on the right. The hydrogen wavelength, about 8 inches, multiplied by the binary number representing ‘8’ shown next to the woman gives her height, 64 inches. The figures represent the type of creature that created Pioneer. The man’s hand is raised in a gesture of good will. Across the bottom are the planets, ranging outward from the Sun, with the spacecraft trajectory arching away from Earth, passing Mars, and swinging by Jupiter. Contact was lost with Pioneer 10 in 2003 when it was some 12 x 106 km from Earth (80 AU). The ship is now ghosting its way in the general direction of Aldebaran, a star over 60 light years away in the constellation Taurus. It will take the spacecraft more than 2 million years to reach it. A second plaque of the same design was attached to Pioneer 11, launched just over a year after the first. This also journeyed to Jupiter before becoming the first spacecraft to explore Saturn and its rings up close. 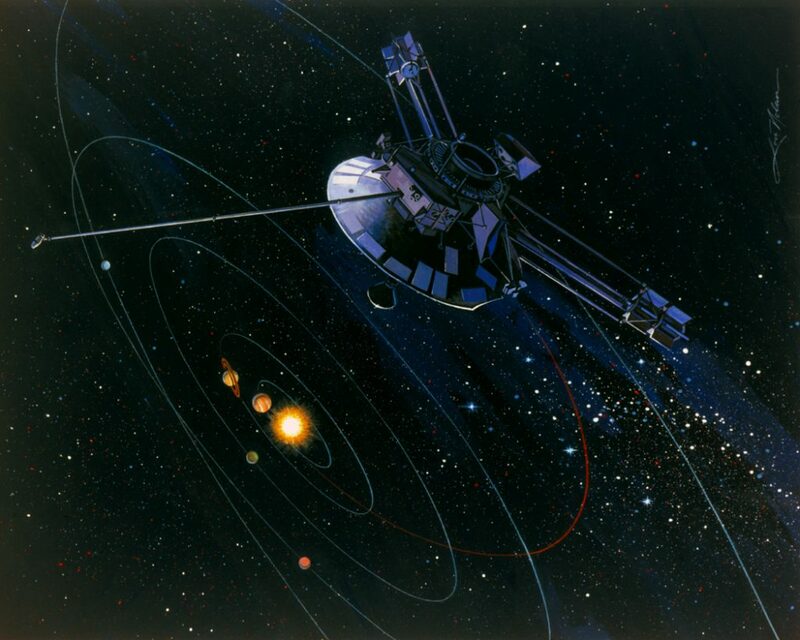 As with Pioneer 10, contact was lost as it headed into outer space where it is now moving towards Sagittarius and the centre of the galaxy.